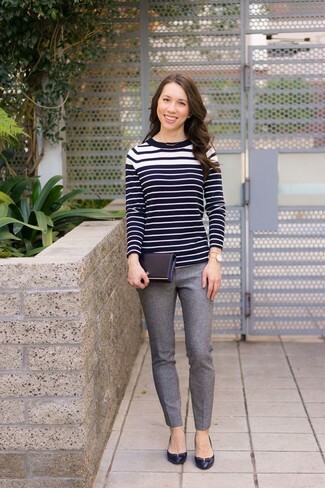 If you're scouting for a casual yet totally chic ensemble, make a black and white horizontal striped crew-neck sweater and grey wool skinny pants your outfit choice. Both garments are totally comfy and will look fabulous paired together. Wearing a pair of black leather pumps is a simple way to add extra flair to your ensemble. If you're on a mission for a casual yet absolutely chic getup, marry a brown leather biker jacket with Jil Sander slim leg back yoke flannel pants gray. Both garments are totally comfy and will look fabulous paired together. Bring instant glamour to your look with black leather ankle boots. If you're scouting for a casual yet totally chic getup, reach for a black long sleeve t-shirt and Jil Sander slim leg back yoke flannel pants gray. Both items are totally comfy and will look fabulous together. Black leather pumps are a great choice to complement the look. If you're on the lookout for a casual yet absolutely chic outfit, marry a black long cardigan with Jil Sander Slim Leg Back Yoke Flannel Pants Gray. 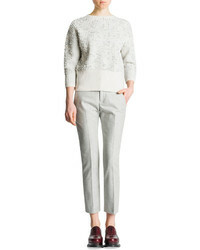 These garments are very comfortable and will look great when paired together. For something more on the daring side to finish off this outfit, grab a pair of black and white canvas low top sneakers.